Patton (1970): Dir. Franklin J. Schaffner. Written by: Edmund H. North and Francis Ford Coppola. Based upon the books Patton: Ordeal and Triumph by Ladislas Farago and A Soldier’s Story by Omar N. Bradley. Starring: George C. Scott, Karl Malden, Stephen Young, Michael Strong, and Carey Loftin. Rated PG-13 for sequences of war violence, disturbing images, language and some smoking. Running time: 172 minutes. General George S. Patton proved to be the sort of complicated, enigmatic character perfectly suited for a big-screen epic. The film of course showcases the bravura performance of George C. Scott, but it’s the strength of the script, cinematography, and direction that prove just as impressive. Recounting the general’s WWII career, the film takes us across continents as the Allies steadily advance into German lines. Lauded universally for his talents on the battle field, the “Old Man” nonetheless encounters opposition from his allies for his ego, bravado, and bloodlust. 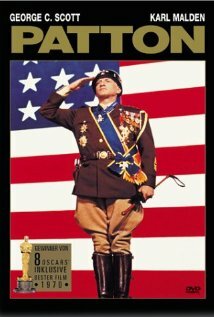 Like the best epics (and this is one of them), Patton thoroughly probes the nuances and contradictions of its subject. It never makes the mistake of pinning the general down, portraying a figure that genuinely abhors warfare in one moment and yearns for it in another. Scott could have easily lapsed into caricature and still earned Best Actor, but he expertly balances intensity with humor, and bombast with tenderness. The opening scene with Patton briefing his men remains iconic, but it’s Patton’s quiet moment with a dying solider as he fights his tears that lingers most with me. While inherently a different film from Lawrence of Arabia, Patton learns much from that legendary film but possesses perhaps a clearer sense of focus. Director Schaffner delivers all the destruction and spectacle we would expect from a World War II epic, but never to the extent that it shifts focus away from Patton himself. Future film legend Francis Ford Coppola, who co-wrote the script, shows flashes of The Godfather and Apocalypse Now, particularly in a montage toward the end that juxtaposes religious imagery with terrifying violence. Pervading Patton is an overwhelming sense of wonder—not just for Patton’s abilities, but for his humanity. It is a movie worth seeing for a life so carefully examined—one that transcends the theater of war.